I think the only one surprised at today’s jury verdict was the man in the spotlight: Paul Tanaka. It took a jury only three hours to find the retired undersheriff guilty of conspiracy to obstruct justice and obstruction of justice. A sentencing hearing will take place June 20, and he could face 15 years in prison. Prosecutors painted Tanaka as the “director” in a scheme to hide an informant from FBI investigators looking into charges of excessive force in the county jails. Before that, media outlets like The L.A. Times persistently conveyed that narrative, heaping all of the Sheriff’s Department’s woes upon the Sansei second-in-command. 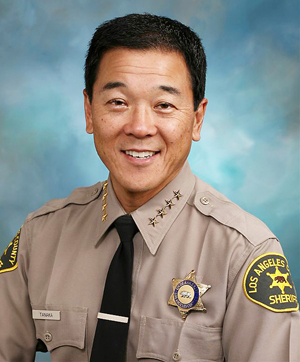 What a stunning fall of grace for Tanaka, who had been on track to become the first Asian American to lead the L.A. County Sheriff’s Department. Tanaka, a graduate of Gardena High and Loyola Marymount, quickly rose through the ranks at the department and was Lee Baca’s right-hand man. It is a shame that we never got to hear from Baca himself, as the defense requested, about the role that he played in this whole mess. When I talked to Tanaka back in 2014 during his failed run for L.A. County sheriff, he said what he reiterated on the stand during the trial — that basically he was following Baca’s orders. But surely Tanaka knew that wouldn’t fly as underlings accepted plea deals and Baca himself pleaded guilty in February, admitting that he lied to the feds when he said he knew nothing about plans to hide the inmate/informant. Was it arrogance or ambition that led Tanaka to think he could overcome what was obviously the prevailing sentiment? As part of that plea deal, Baca did not have to testify to the extent of his culpability and will receive a sentence of no more than six months. That’s easy time compared to 15 years. There are mixed feelings about Tanaka in the Japanese American community, but I think that when one of us succeeds we all feel invested in that success and that the reverse is also true. Many will rejoice that justice has been served. Others will say that he took the fall in a turf war between rival agencies. For Rafu readers, we can only imagine what George “Horse” Yoshinaga would say on this day. His son Paul was among the witnesses for the defense. In Gardena, I don’t think the long-time-coming verdict changes the feelings about the mayor, who still has broad support. Gardena is a quiet, relatively safe town with a budget surplus and rising property values. It is not Bell or San Bernardino. That is part of Tanaka’s legacy as well. With today’s verdict it is a sad, complicated legacy. Thank you for writing to the Los Angeles Police Department, http://www.lapdonline.org. For verification purposes, the incident you are referring to is NOT related to the Los Angeles Police Department. For assistance with your request, please contact: http://www.lasuperiorcourt.org to file a civil lawsuit.